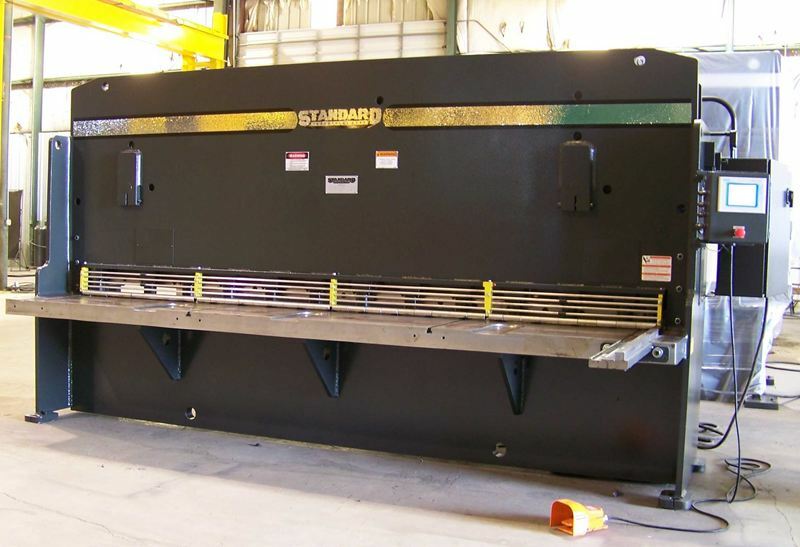 Standard Industrial offers a complete line of 100% U. S. made hydraulic press brakes, shears as well as four column, c-frame and straight side presses for traditional and non-traditional production facilities. Read on the learn more about machinery from Standard Industrial, and contact us today to request a quote. Contact us today to learn more and request a quote on Standard Industrial press brakes. Standard Industrial shears are hydraulic, true guillotine drive shears with many standard features and an extremely wide variety of options to choose from. The hydraulics and electrics are complete including oil filter, disconnect switch, magnetic starter and control voltage transformer. A set of premium, four edge blades with shock resistant, chrome alloy are standard on all new shears. There is not a more heavy duty, versatile shear manufactured in the U.S.A. or any other country. If you’re interested in learning more and requesting a quote on a Standard Industrial shear, please contact us today. Standard Industrial manufactures leading hydraulic presses in the following configurations. The model AP Four column press is a vertical, down acting direct hydraulic press with a guided platen powered by an extremely heavy duty machine tool quality hydraulic cylinder. This press is designed for heavy production work for all sizes of facilities. The model CC C-frame press is perfect for applications requiring center-loads or even tonnage across the bed. The model DC is an exceptionally heavy duty C-frame style press that is specifically designed to handle virtually any application. It is perfect for applications requiring off-center and center-loads and un-even and even tonnages across the bed. The model AM straight side press is perfect for full length forming at full tonnage as well as left to right and off-center loading at full tonnage via our extremely heavy duty gibbing system and enclosed end frame design. The model CM straight side press is perfect for full length forming at full tonnage as well as left to right and off-center loading at full tonnage via our extremely heavy duty gibbing system and enclosed end frame design. The model DCSS is the pinnacle of the straight side press configuration, there simply is no design that is more heavy duty. Built similarly to the DC style press, the DCSS takes yet another step toward providing the most frame strength available on any press on the market. If you’re interested in learning more and requesting a quote on a Standard Industrial hydraulic press, please contact us today.